Get a gym-quality workout in the comfort of your own home with the MultiSports LC Elliptical 880L Cross Trainer. The MultiSports LC Elliptical 880L features adjustable foot-plates, 21” stride length and 3” pedal spacing to give a smooth natural foot pattern with a wide circular elliptical motion. The long stride length of this elliptical trainer makes it ideal for taller users. The MultiSports LC Elliptical 880L features dual-action handlebars – hold onto the moving arms to work the upper body in unison with the lower body, or hold onto the static handlebars and just work the lower body. The static handlebars incorporate pulse grip heart-rate sensors which allow you to keep check of your heart-rate as your exercise on the included digital LCD monitor. The MultiSports LC Elliptical 880L operates smoothly and quietly thanks to its magnetic ECB eddy-current braking system. This elliptical trainer offers bi-directional motion so you can pedal forwards or backwards. There are 8 resistance levels to choose from so you can vary the intensity of your workout. In addition, the MultiSports LC 880L elliptical cross trainer offers 8 programs to keep your workouts interesting and challenging, including 2 Preset (mountain and fat burn), 3 heart-rate programs, target watts, constant power and manual. The MultiSports LC Elliptical 880L’s console features an LED dot-matrix display window which shows motivating workout stats including time, speed, distance, RPM, watts, calories burned and heart-rate. This elliptical trainer is self-powered so you don’t have to worry about placing it near a power socket. The console is powered by 2x AA batteries. The MultiSports LC Elliptical 880L is well-constructed with a solid stable design and is suitable for home use as well as light commercial use (less than 4 hours per day), with a maximum user weight capacity of up to 350 lbs. The frame is constructed with heavy 11-gauge steel and there are precision machined sealed steel bearings at all pivot points. 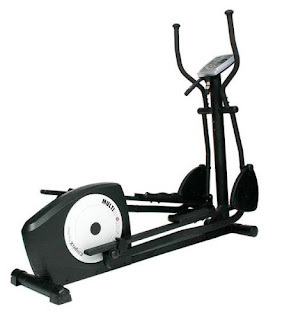 This elliptical cross trainer utilizes a rear-wheel drive mechanism with a Poly V-belt drive system. Elliptical cross trainers offer an effective total-body low-impact workout that’s easier on your knees and joints compared to many other forms of exercise. The action of an elliptical trainer can be compared to skiing, working both the arms and legs, or alternatively you can hold onto the static handlebars and concentrate on a lower body workout. Besides, toning and strengthening, elliptical trainers give a good cardio workout too, helping to burn calories, improve circulation and lung capacity. Exercise in general helps to improve your overall mood by releasing endorphins – the feel good factor! N.B. It’s always advisable to consult your doctor or health care professional before undertaking any new exercise regime. Always follow the manufacturer’s instructions for safe use of exercise machines/equipment.